Arcwelder have never come West before and the are enjoying it. They call themselves a punk band but they are pretty heavy. The bassist spins around in place. 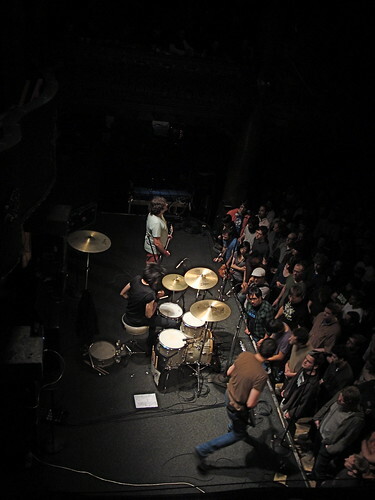 The drummer sings, then mock complains about the bassist taking attention away from him. They know how to put space in their music. Is the guitar/bass/drums trio teh perfect form for a rock band? The audience is young and white. It is an "all ages" show. I see a couple of young kids and worry if they are wearing earplugs. The twenty-something in front of me is bragging about going to Europe with his parents this summer. Some high schoolers reminisce about middle school. What do Shellac believe in? integrity, honesty, playing well, ROCKING, sound quality, tuning guitars, having a support band they like, being deadpan, simplicity, stopping and starting. 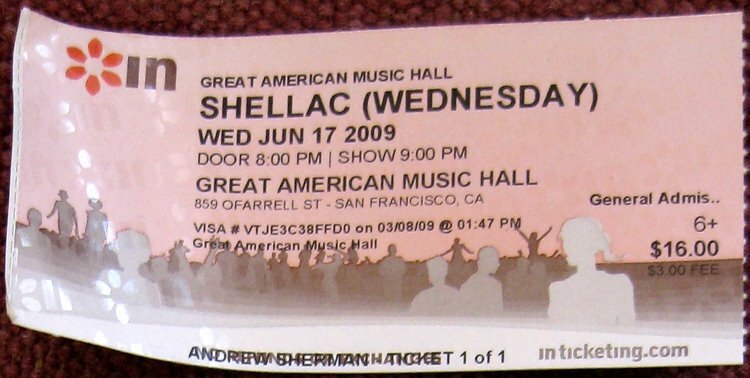 Shellac don't care about impressing the audience, selling a lot of music, advertising. Arcwelder were good but Shellac are better. They are have a perfect balance of musicianship and attitude. They setup their own gear, with the drums at the front. Todd Trainer is a great drummer, presumably his unavailability is what is keeping Led Zeppelin from touring. Bob Weston mostly keeps it simple but he can play like John Entwistle when he wants. Steve Albini is intense. He can make his guitar do a lot of noises, but it is all for a musical reason. When he tunes his guitar the other two take questions from the audience. This is pretty funny. What's wrong with the Cubs? They need to learn to hit. What's that cymbal at the back? A cymbal. Near the end Albini breaks a string. He says he is pleased as he gets to play his other guitar ("because our guitar techs all died"). When someone dares to call out for a sing Albini looks confused and assures the heckler that the band have it all worked out. A concert like this is what keeps me going out to see music. The funny thing is that Shellac aren't perfect. Albini could be a better singer. Some of their songs (e.g. The End of Radio) are superior to the others. They haven't made many records. But I hope they never change.